office Convert PowerPoint to Image Jpg/Jpeg is an easy-to-use and professional document conversion tool. The converter produces fully functional IMAGE documents with text, pictures, graphics etc, using the original layout.It can create multifarious image formats as JPG,BMP,GIF,TIF,TGA,RLE,PNG,EMF,WMF from dozens of documents as PowerPoint (ppt,pptx,pptm) with retaining the original style. It can convert in batches to improve your work efficiency. Convert PowerPoint (PPT,PPTX,PPTM) to JPG,BMP,GIF,TIF,TGA,RLE,PNG,EMF,WMF. ...... More professional and easier interface is on the market. You must like it as soon as you use it. Free download now! Provide the customized Command Line service for server and developer. 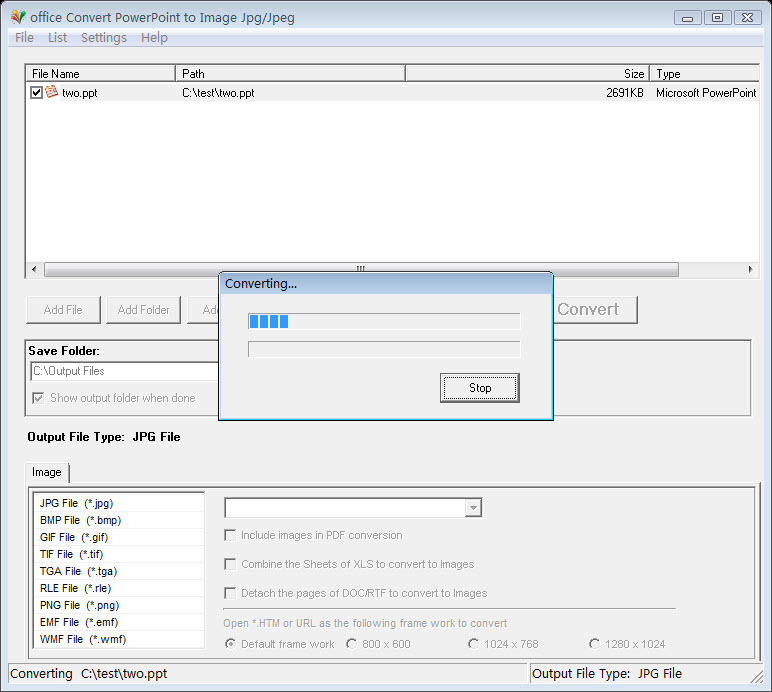 Batch Convert PowerPoint (PPT,PPTX,PPTM) to JPG,BMP,GIF,TIF,TGA,RLE,PNG,EMF,WMF. It can simultaneously convert comprehensive files to one certain format once. Convert document to Vector format WMF. Drag and drop files and batch conversion. Choose the entire folder to convert. Intelligent processing of large files. Easy to use. Convert with one click. Create images with high good quality. Process the conversion at very high speed. It can automaticly view the output files after converted. Provide the best service for you. Free Convert PowerPoint (PPT,PPTX,PPTM) to JPG,BMP,GIF,TIF,TGA,RLE,PNG,EMF,WMF. Convert Excel (XLS,XLSM,XLSX) to JPG,BMP,GIF,TIF,TGA,RLE,PNG,EMF,WMF. Convert Htm/Html to JPG,BMP,GIF,TIF,TGA,RLE,PNG, EMF,WMF. Convert Word (doc,docx,docm),RTF,PowerPoint (ppt,pptx,pptm) to PDF. Convert documents to JPG,BMP,GIF,TIF,TGA,RLE,PNG, EMF,WMF. Small tool for converting images! Qweas is providing links to office Convert PowerPoint to Image Jpg/Jpeg 6.1 as a courtesy, and makes no representations regarding office Convert PowerPoint to Image Jpg/Jpeg or any other applications or any information related thereto. Any questions, complaints or claims regarding this application office Convert PowerPoint to Image Jpg/Jpeg 6.1 must be directed to the appropriate software vendor. You may click the publisher link of office Convert PowerPoint to Image Jpg/Jpeg on the top of this page to get more details about the vendor.